Actually, one of his cousins told me that she doesn’t always stuff the bitter melon if she doesn’t have time – instead she slices the bitter melon thinner and makes only meatballs out of the mixture and cooks them together. Sounds good, too! The soup is made of Chicken Broth, 1 whole Shallot, Mushroom Seasoning, Fish Sauce and Sugar. Chop green onions and cilantro to add towards the end. For this large of a batch, I used 64 oz low sodium chicken broth + 2 cups of water. As usual, amount of seasoning is all to taste – so start small and add as you go. 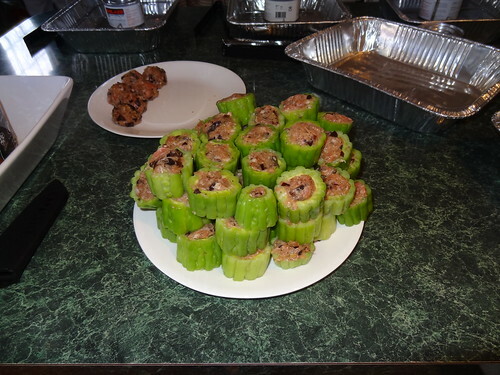 Before I walked away, I added 4 tbs Mushroom Seasoning, 3 tbs Fish sauce and Sugar. When I came Má was tasting and adding, so I’m not sure what we ended up with. Just checking in…Ma making some adjustments to the soup. We also broke in the grill (with new grill grates) the previous owners graciously left for us to use. We marinated Korean BBQ Short Ribs and Chicken Wings for more than a day – these are always a family favorite. Any jar of Korean BBQ marinade will do – look for the one marked for Gal Bi and if you can tell pick one with higher Asian Pear content. If you want to spend a little more time on the marinade, get an Asian Pear and grate before adding to the marinade. The flavor will be richer and sweeter. For the chicken wings, mix up equal parts Sugar and cloves of minced garlic (so 4 tbs Sugar and 4 cloves minced garlic), Maggi seasoning (or soy sauce if that’s all you have) and a knob or so of ginger. Marinade should be on the thicker side. Mix well dissolving the sugar and add to a big Ziploc bag with the wings. Turn over every 4 hours of so to make sure the sauce gets in all the nooks and crannies. 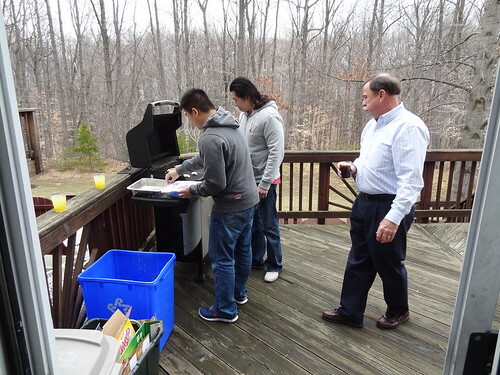 Dad oversees the brothers on the grill. Finally it was on to the cakes and games. We bought two cakes for Dad and Má, but Ba (Thuan’s father) also bought an ice cream cake and a cousin brought a massive chocolate cake from Cheesecake Factory. Suffice it to say, the kids were operating on a mega sugar high. 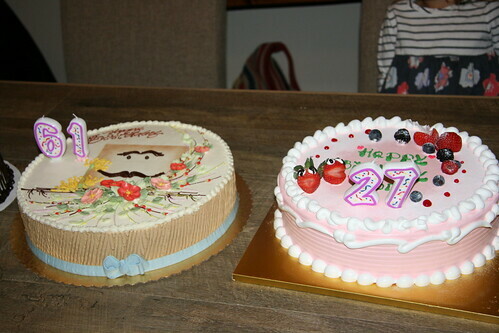 The mustache cake was a white cake with strawberry filling from Cakes by Long, and the other a fresh creme strawberry cake from Breeze Bakery. 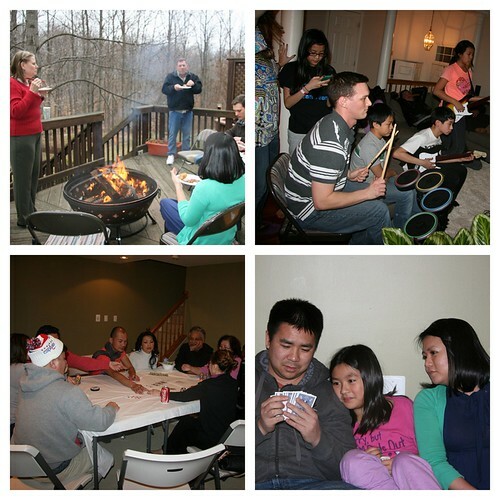 We finished off the night with poker and Sap Sam (also known as 13 Cards) for the adults, and Rock Band for the kids upstairs. Can you believe that was the first time we used the basement since moving in? We’ll eventually get furniture down there – but the never ending cycle of home updates and furnishing continues. Trash and Recycle Day can’t come soon enough. Now who wants to come over and vacuum?